We are Shyam N., Allen F. and Abhishek B., aspiring Robotics Engineers hailing from Chennai, India. We have been successfully selected to present our highly innovative and advanced technical project of a Mars Rover at the 20th International Mars Society Convention, taking place at University of California, Irvine from September 7th - 10th, 2017. What is Mars Society Convention? The Mars Society is an international organisation that advocates space travel to Mars and does extensive research and development with various space agencies including the likes of NASA. The 20th International Mars Society Convention is a gathering of the world's leading experts in Space Robotics, Life Sciences including Scientists of various disciplines and Top-level Executives of leading organisations that are commited to space travel to Mars. To find out more information on the same topic, do click here. What is our submission about? The paper describes a Martian Exploratory Rover designed with the suspension system based on the anatomy of a spider. The Arachnid’s agility is implemented in a Carbon Fiber suspension structure.. The Guidance system of the Rover is automated, and relies upon stereo imaging from the lead camera. This analyses 3 ft. in front of the rover, and carries out an Algorithm based upon Artificial Neural Networks & Fuzzy Logic to optimize efficiency of traversal and fuel consumption. The Robotic Arm onboard the Rover is a 7 DOF Robotic Arm with a planetary base gear drive, and a harmonic gear-train for the shoulder, with the additional degree of arm being a linear actuator for a DOF in the 2ndlinkage of the arm. Sensors and instruments to identify the presence of sugars, amino acids, lipids in the soil are integrated on the rover. We are aspring Robotics Engineers from Chennai, India. 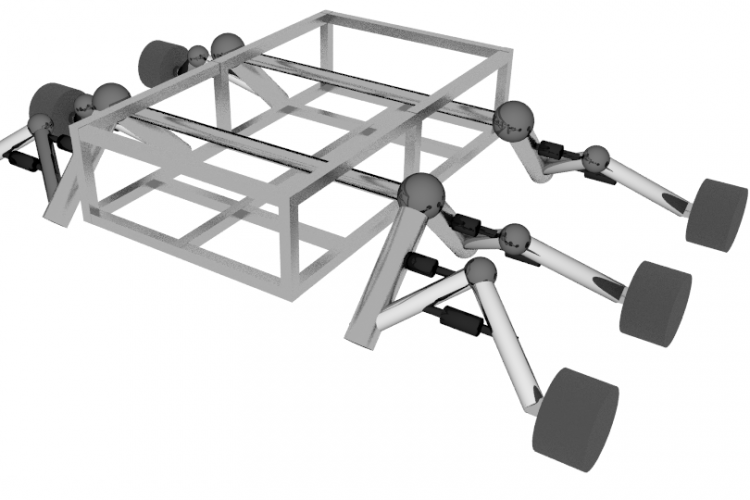 We have commited several number of years to the advancement of this field for many years and we are specialists in designing compact and cost efficient robots. Our project has been recognised and awarded in competitions across the world. Our financial status as of now is not strong enough to attend the convention and we humbly request you to support us in any way you can. Attendance of this convention is testament to a stepping stone in our professional life and we would ever be grateful to all our well-wishers. The financial support will be utilised for travelling to the specified location and accomodation throughout the period of the convention. We are truly grateful to your enormous generosity and kind heartedness bestowed upon us, and we will express our gratitude in anyway that we can. Your share could be as good as a donation for Project - X: Mars Rover! Not everyone can afford to take care of their loved ones. Project - X: Mars Rover's life can only be saved by donations made by kind people like you.